Perched high on a cliff over the ocean on Bali's south-western tip is the temple of Ulu Watu. In addition to the fantastic view from the temple, especially at sunset, the temple is famous for its gang of monkeys and perhaps appropriately its Kecak dance performance. The cliffs and surf north of the Ulu Watu Temple. The temple itself is open only to Hindu worshippers. You can visit the rest of the complex every day. The admission cost is 1,000 Rp. The Kecak dance is held every Sunday, Tuesday and Thursday evening starting around sunset (6 to 7 pm). With the temple and the sun setting in the background, this is easily the best place in Bali to see the Kecak. Some of the temple's many mischievous monkeys. Arrive for a performance early so that you'll have time to take in the temple complex and the views from the cliff-top. Be on your guard around the monkeys. They will grab anything they can get ahold of, like baseball caps, handbags, etc. 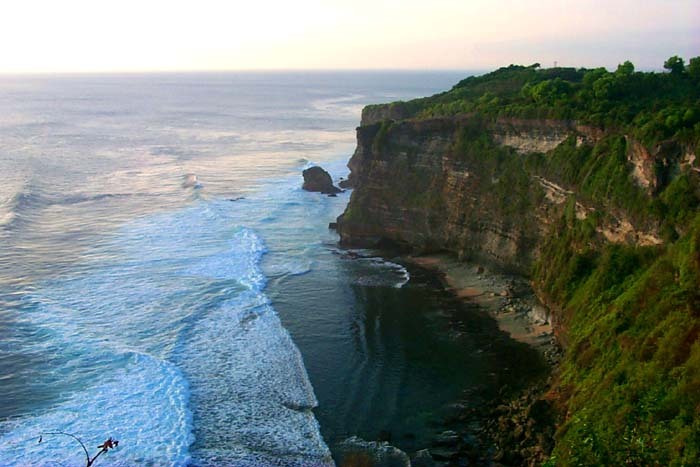 The Ulu Watu area, especially the beaches just north of the temple, are also world-renowned for their surfing. The Pantai Suluban area is the place to surf on Bali, even though it may involve a hike down a narrow gorge in the cliffs. Some of the surf shops around Kuta offer shuttle bus services to the Ulu Watu surf spots.